We couldn't resist sharing a quick snippet from our new "Eight Ideas of the As-a-Service Economy" study that reveals some rather alarming news: service providers are blaming everyone bar themselves for obstructing their progress towards As-a-Service. At fault number 1 - the Clients. Top of the lists are their clients themselves, with 78% of service provider executives (from a pool of 238) citing their unwillingness to venture into risk/gainshare models with them. Considering most enterprise clients we talk to complain that their provider refuses to budge from their predictable, profitable FTE delivery model, baffles me here. At fault number 2 - the Advisors. Next up are sourcing advisors - those lovely folk who bring them to the table and horsetrade to get deals done. Apparently, they are not selling the evolving model to enterprise clients and are just not very capable. We are starting to see more As-a-Service traits in some mid-tier deals, where there is less wiggle-room to make huge profits on wage arbitrage, and these frequently are too small to warrant several hundred grand being spent on an advisor. The advisor model is still built for the old world of big scale deals, not the new world where analytical and creative skills, technology enablement and automation are the watchwords. Least at fault - the Providers themselves. 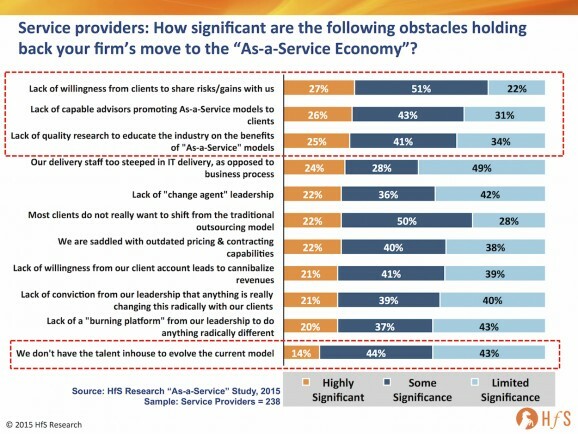 And very last on the list (no sh*t) is the fact that they are struggling with their own inhouse talent to shift the model to As-a-Service. Well that's great news, as I thought it might be a bit of a struggle for providers to retrain their developers and project managers to think analytically, help clients with design thinking, laying out an automation roadmap etc. Now we can all rest easy with the knowledge that the providers will save the day, while the rest of us clients, advisors and analysts can all go away and die somewhere on the scrap heap of legacy labor models, SLAs and dull irrelevant research. As we reach the end of the runway with the legacy model (which still has a way to go for many enterprises) there needs to be a much better effort collectively to discuss the actual measures enterprises need to adopt to take better advantage of the technology enablers and hone our skills accordingly. Many advisors are clearly still making a good living advising on the old model, otherwise many would cease to exist, while analysts clearly do a poor educating the market on real world examples of how to make the shift (and persist on an old world model themselves to engage with clients). Meanwhile, if service providers are as good as they think they are, they need to find better ways to convince their clients to trust them more, to work with the on joint projects of discovery etc. Lee rhetoric, more dialog among the key stakeholders and better real-world education is the only real formula for success here. I love this post! But how did the clients answer to the same question? Was it the service provider's fault? I believe, that currently nobody really wants the change. The clients, as they don't want to take the risk, the advisory firms, because they would not make as good revenues and the service providers like to showcase their capabilities on their homepages but not in real life ... because they would risk their revenue streams, too. Coming back to blaming the analyst: I like your recent research changes, drawing masses of data opposed to asking just a couple of reference clients. But why not starting a second stream and go for a series of really insightful case stories, looking at best practice. Why not even start a competition? If you would go away from the usual jury model and go there for a data driven judgement methodology, you would make a some significant impact!